Our new stars represent Your Views. if you think that one of the listed pubs needs more or less Stars we need you to tell us. To do this please just hover over the 'Rate Pub' link and then click stars of your choice. Your new rating will get added and if you want to down or up-grade existing stars you can do that the same way. Sadly many pubs are closed down - please email us if you find one that is and we will delete it. Is there a pub you know that we have not listed? If so please fill in the form on the Add A Pub page and be sure to fill in the Comments box. If a listed pub is not described accurately just drop us an email explaining and we will edit the entry. Become a supporter - we have plans for you! 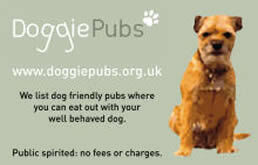 Spread the word and hand out DoggiePubs Calling Cards to anyone you see with a dog. Tell everyone to buy one of the Apps (iPhone and Android both now available). The scope of DoggiePubs is entirely down to you – thank you! There are over 7000 pubs listed now, wow, amazing. Do you know of any more? You may notice that we have included the occasional cafe as well (due to popular demand) plus a very few hotels, B&Bs and cottages, however basically we will remain a pub site. Should you wish to contact us please email Millie@doggiepubs.org.uk. You may also write to us, especially if you would like to be sent her CALLING CARDS. 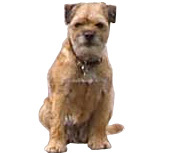 Why not send off for our 15 free Calling Cards, then when you visit a pub or chat with other dogs you can give them a card. Notice Boards in the Vet’s waiting rooms are good places to leave a card, and make sure your local pet food shop has one too.